Most people understand the necessity of drinking plenty of water. It can be hard for readers to take time out of their busy days to ensure they are adequately hydrated, though. 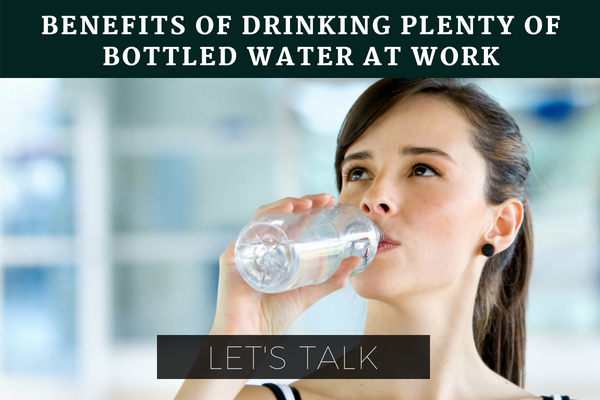 Read on to find out about a few of the benefits of drinking plenty of Water at Work to learn why it’s so essential to take a few minutes out of the day to ensure proper hydration. Dehydration can cause weakness and fatigue. This makes employees feel sluggish and makes it difficult for them to get their jobs done correctly. Drinking plenty of water can give employees more energy, especially when they work at physically taxing jobs that cause them to sweat substantially. Given that around three-quarters of the human brain is made up of water, it should go without saying that dehydration can have a dramatic impact on how well it is able to function. Drinking enough water can improve focus, increase alertness, and improve reaction times and attention span. This makes it much easier to get work done efficiently. Levels of cortisol, a stress-inducing hormone, must be kept within an ideal range to prevent unnecessary stress. Drinking plenty of water helps to keep employees’ cortisol levels within a healthy range, which can reduce stress and improve their moods. Happy employees are productive employees. They are more likely to be able to collaborate successfully with others and complete their tasks effectively. Unfortunately, even minor dehydration can have a dramatic effect on a worker’s mood, so it’s important to stay hydrated throughout the day. Dehydration is known to cause headaches and migraines due to reduced oxygen flow to the brain. These headaches can range from minor annoyances to debilitatingly painful ordeals that may even cause employees to leave work to recover. Drinking at least two to three liters of water each day can substantially reduce the chances of developing headaches. Staying healthy requires drinking a good deal of water. This is true not just because it helps to reduce the chances of developing the physical, mental, and emotional problems listed above, but also because it helps reduce cravings for unhealthy snacks.